In any given year, approximately 50 percent of Tim's sales are a result of representing clients in the purchase of pre-owned vessels. Purchasing pre-owned vessels on the Brokerage market is a great way to obtain quality boats that have been well maintained at a substantial discount. 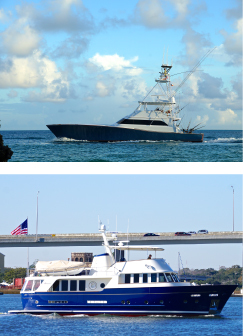 The yacht brokerage market bears many similarities to the real estate brokerage market. Buyers and Sellers are each represented by their Broker who represents their interests in the purchase. This service is provided at no cost to the Buyer since sales commissions are borne by the Seller. Contact Tim for assistance in navigating through the variety of vessels there are to choose from in today's market. Tim's 15 years of expertise in the yacht brokerage industry lends itself to ensuring that you find the boat which suits your lifestyle within a budget that makes you comfortable. He can objectively inform you of the condition of particular vessels on the market before you invest your time travelling to look at the boat. He will help you determine if there are similar boats on (and off) the market, the history of the yacht, how long it has been on the market, and the motivation of the seller. With Tim's knowledge of current market conditions and information on recent sale prices of similar vessels he can guide you towards making the proper decisions when purchasing a brokerage vessel. There are a myriad of factors involved when negotiating a deal, including: price, financing, terms, date of possession and often the inclusion or exclusion of repairs and furnishings or equipment. There may be give and take associated with every step of the deal. Having an objective and experienced broker will facilitate in making the process of purchasing your vessel as smooth as possible. Tim advises his clients throughout the due diligence process of evaluating their chosen yacht. He can help to identify a few qualified Marine and Engine Surveyors for you to choose from to inspect your vessel and can recommend the extent of the survey to be used in the inspection. He will attend the survey/sea trials to guide you through negotiating any unforeseen issues that may arise. He will assist in estimating the time and cost of correcting these issues to help you move forward towards closing. Tim is familiar with all Documentation required for your State or Country. The closing process can include negotiations on the original Contract, Titling and Registration or Coast Guard Documentation, sales tax pertinent to specific States, licensing and other documents needed to complete a sale. With the assistance of a knowledgeable broker, you are ensured that the entire process of buying or selling is handled properly from beginning to end. Clients regularly call Tim for recommendations on travel, fishing and service issues. Tim enjoys talking with clients about their boating adventures and is available to offer support if a boating issue should arise. Over the years he has developed a trusted network of marinas, manufacturers, boat yards, captains and mechanics that can steer you on the right direction in your boating endeavors.